In 1918, Washington, D.C. began to shut down its schools, theaters, and churches in an effort to keep people alive. The entire city, and the entire east coast, was at the mercy of one of the worst flu outbreaks in American history: the 1918-1919 H1N1 influenza pandemic. Nearly a century later, the NEH funded the design of a digital encyclopedia that intends to be the ultimate resource for scientists and historians interested in the infamous pandemic. Created and developed at the University of Michigan-Ann Arbor, the Encyclopedia includes thousands of original documents, pictures, and newspaper articles from American communities affected by the pandemic. Not only does the encyclopedia offer primary sources, but it also summarizes the trajectory of the disease in fifty cities across the country. Each city page has a timeline, a short essay, and postcards that reveal the personal tragedies inflicted by the flu. 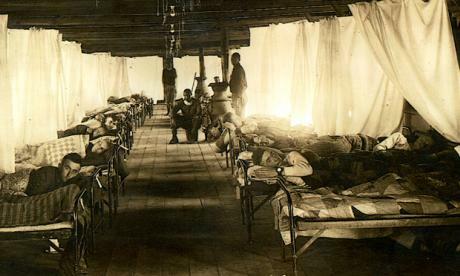 African American orderlies tending to white soldiers recovering from influenza in the isolation barracks at Camp Bowie, Texas. (From Record Group 112 – Records of the Army Surgeon General’s Office, Box 14, Folder 710 Influenza-Camp Bowie, Tex., National Archives and Records Administration, College Park, Maryland). Even though the flu is still a winter concern, no outbreak in recent years has come close to the 1918-1919 epidemic in size or scale. 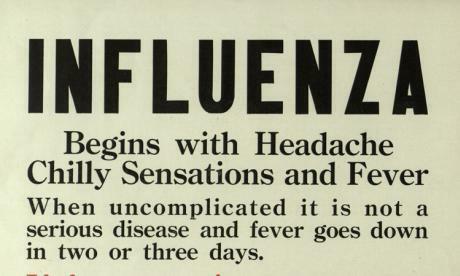 The Influenza Encyclopedia now shares a wealth of knowledge for anyone – historians, teachers, and epidemiologists included – interested in the disease that settled on the nation in deadly headaches, chilly sensations, and fevers. This entry was posted in Uncategorized and tagged education, flu season, H1N1, National Endowment for the Humanities, NEH, NEH Office of Congressional Affairs, research, resources, The American Influenza Epidemic of 1918-1919: A Digital Encyclopedia, University of Michigan-Ann Arbor by nehblog1. Bookmark the permalink.